We don't base our guarantee on whether or not you pass your exam. 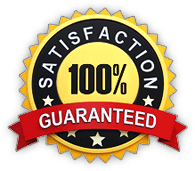 From the moment you purchase our product, we provide you with a 100% money-back guarantee. If you are not satisfied for any reason, simply contact us for a full refund within 120 days of your purchase. No other company can offer a stronger guarantee! Ready to pass your exam? Get started now!